It's been a big month at Slotland during their 17th birthday celebrations. (Wow! Really?! An online casino's been around that long?!) There have been freebies and bonuses and a new game is expected next week. But one of the coolest birthday presents was the big progressive jackpot win that started off the month! 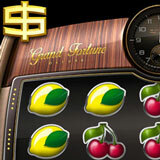 Charles M. won $207,619 playing the Grand Fortune slot. He's a car buff and confessed he'll probably blow his winnings on a new car. His kid will love that since he'll get the current car! Slotland expects to launch a new hunting-theme slot with a sticky expanding wild later this month. The new game will also have a symbol replacement feature that changes regular symbols into Double Wilds and boosts chances of winning. At the moment, Slotland has 35 real money online slot games, all available exclusively at Slotland. They're all compatible with iPhones and other iOS devices as well as Android smartphones and tablets. Slotland's 17th birthday celebrations continue through October. A draw at the end of the month will award $6500 in birthday bonuses. Deposit at least $75 between October 16 and 31 to be included in the prize draw.